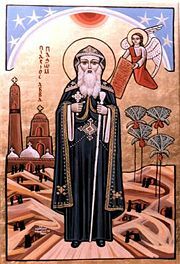 Coptic icon of Pachomius the Great, the founder of Christian cenobitic monasticism. Cenobitic monasticism (also spelled coenobitic) is a form of monastic organization that stresses the community life of a monk as opposed to the solitary life of a hermit. The English words "cenobite" and "cenobitic" are derived, via Latin, from the Greek words κοινός and βίος (koinos and bios, meaning "common" and "life"). A group of monks living in a community is often referred to as a "cenobium." The older style of monasticism, to live as a hermit, is called eremitic; and a third form of monasticism, found primarily in the East, is the skete. There are several cenobitic orders in the world's religions, which provide a sense of monastic community to like-minded practitioners. It is thought that the community life helps the monks to attain greater concentration through providing group support and role models. Typically, the life of the cenobitic monk involves the residence in a monastery and a daily schedule regulated by strict rules (such as the Rule of Saint Benedic in western Christianity or the Vinaya Pitaka in Theravada Buddhism). Cenobitic monasticism exists in various religions, though Buddhist and Christian forms are the most prominent. The organized version of Christian cenobitic monasticism is commonly thought to have started in Egypt in the fourth century C.E. Christian monks of previous centuries were usually hermits, especially in the Middle East; this continued to be very common until the decline of Syrian Christianity in the Late Middle Ages. This form of solitary living, however, did not suit everyone. Some monks found the eremitic style to be too lonely and difficult; and if one was not spiritually prepared, the life could lead to mental breakdowns. For this reason, organized monastic communities started to be created, so that monks could have more support in their spiritual struggle. While eremitic monks did have an element of socializing, since they would meet once a week to pray together, cenobitic monks came together for common prayer on a more regular basis. The cenobitic monks also practiced more socializing because the monasteries where they lived were often located in or near inhabited villages. For example, the Bohairic version of the Life of Pachomius states that the monks of the monastery of Tabenna built a church for the villagers of the nearby town of the same name even "before they constructed one for themselves." This means that cenobitic monks did find themselves in contact with other people, including lay people, whereas the eremitic monks tried their best to keep to themselves, only meeting occasionally, for prayer. Cenobitic monks were also different from their eremitic predecessors and counterparts in their actual living arrangements. The eremitic monks lived alone, as they were hermits, whereas the cenobitic monks lived together in small houses or monasteries. Each dwelling would house about twenty monks and within the house there were separate rooms or "cells" that would be inhabited by two or three monks. This structure of living for the cenobitic monks has been attributed to the same man that is usually hailed as the "father of cenobitic monasticism," Saint Pachomius. Pachomius is thought to have gotten the idea for living quarters like these from the time he spent in the Roman army, because the style is very "reminiscent of army barracks." Though Pachomius is often credited as the "father of cenobitic monasticism," in actuality it is better to think of him as the "father of organized cenobitic monasticism" as he was the first monk to take smaller communal groups that often already existed and bring them together into a larger federation of monasteries. The account of how Pachomius was given the idea to start a cenobitic monastery is found in Palladius' The Lausiac History, and says that an angel came to Pachomius to give him the idea. Though this is an interesting explanation for why he decided to initiate the cenobitic tradition, there are sources that indicate there were actually other communal monastic communities around at the same time as Pachomius, and possibly even before him. In fact, three of the nine monasteries that joined Pachomius' cenobitic federation were not founded by him, meaning he actually was not the first to have such an idea, since these three clearly had an independent origin. The groundplan of the monastery of St. Gaul in Switzerland, providing for all of the needs of the monks within the confines of the monastery walls. Aside from the monasteries that joined Pachomius' federation of cenobitic monasteries, there were also other cenobitic Christian groups who decided not to join him. The Melitians and the Manichaeans are examples of these cenobitic groups. Even before Pachomius had started on his path toward monastic communities, the Melitians were a group already recruiting members. They actually had "heard of Pachomius' monastic aspirations and tried to recruit him" to join their community. As for Manichaeans, a group founded by a man named Mani, some scholars believe they were the "pioneers of communal asceticism in Egypt," and not Pachomius and the Pachomians as has become the common thought. Mani, himself, was actually influenced to begin cenobitic monasticism from other groups, including Buddhists and Jewish-Christian Elkasites who were practicing this tradition already. Though he was not the first to implement communal monasticism, Pachomius is still an important part of cenobitic monastic history, since he was the first to bring differing separate monasteries together into a more organized structure. This is the reason why (as well as the fact that much hagiography and literature has been written about him) he has continued to be recognized as the father of the tradition. The overall idea of cenobitic monasticism cannot be traced to any single source, however, as many have suggested in calling Pachomius the "founder" of the tradition,. It is more accurate to say that the ideas and practice of cenobitic monasticism derives from numerous groups, including the aforementioned Melitians, Manichaeans, Elkasites, Buddhists, and, of course, the Pachomians. Mar Awgin founded a monastery on Mt. Izla above Nisibis in Mesopotamia (~350), and from this monastery the cenobitic tradition spread in Mesopotamia, Persia, Armenia, Georgia, and even India and China. Mar Saba organized the monks of the Judean Desert in a monastery close to Bethlehem (483), and this is considered the mother of all monasteries of the Eastern Orthodox churches. St. Benedict of Nursia founded the monastery of Monte Cassino in Italy (529), which was the seed of Roman Catholic monasticism in general, and of the order of Benedict in particular. St. Bruno of Carthusia, prompted by the specter of the damnation of the Good Doctor of Paris Cenodoxus, founded a monastery just outside of Paris in the eleventh century. In both the East and the West, cenobiticism established itself as the primary form of monasticism, with many foundations being richly endowed by rulers and nobles. The excessive acquisition of wealth and property led to several attempts at reform, such as Bernard of Clairvaux in the West and Nilus of Sora in the East. ↑ C.H. Lawrence, Medieval Monasticism, 3rd edition (Toronto: Pearson Education Limited, 2001). ↑ James E. Goehring, "Withdrawing from the Desert: Pachomius and the development of Village Monasticism in Upper Egypt," Harvard Theological Review 89(1996), 275. ↑ Goehring, "Withdrawing from the Desert," 282. ↑ Lawrence, 8; Marilyn Dunn, “Chapter 2: The Development of Communal Life” in The Emergence of Monasticism: From the Desert Fathers to the Early Middle Ages (Malden, MA: Blackwell Publishers Incorporated, 2000). ↑ Paul Halsall, Medieval Sourcebook: Palladius: The Lausiac History. Retrieved December 18, 2007. ↑ Harold W. Attridge and Gohei Hata, “The Origins of Monasticism” in Ascetics, Society, and the Desert: Studies in Egyptian Monasticism (Harrisburg, PA: Trinity Press International, 1999). ↑ S.J. Harmless William, Desert Christians: An Introduction to the Literature of Early Monasticism (New York: Oxford University Press, 2004). This page was last modified on 2 April 2008, at 04:19.